The general definition of a KVM Extender is a device that allows you to extend the distance between your console (Keyboard, Monitor, Mouse and other peripherals) and your computer. There are two main types of KVM Extenders: standard CATx/Fiber and a KVM Over IP. 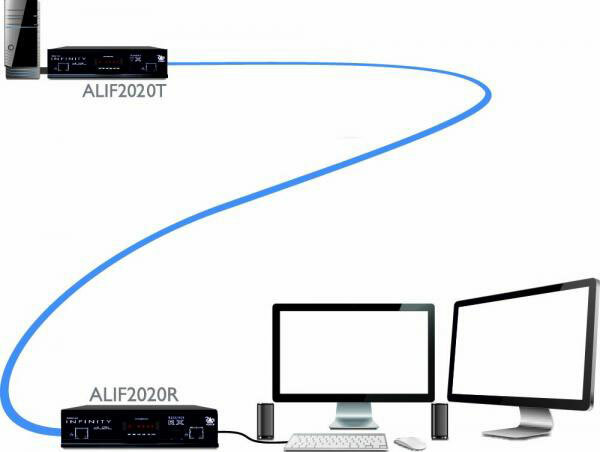 A standard CATx/Fiber KVM extender allows you to access a extend the distance between a local computer and a user console via a CATx or Fiber cable. Standard KVM extenders are great for local point-to-point or simple local point-to-multipoint applications but are limited in features, security, and access methods. The most versatile extender is a Digital KVM extender / KVM Over IP extender. Digital KVM extenders allow you to access your computer or server over the internet with varying degrees of options and security. KVM Over IP can be used to access a single server or a whole data center. KVM Over IP is generally used in Data Center or Server Room environments where there is a large number of devices to control or when there are mission critical servers that need to be accessed out of the office. If you have any questions about which extender solution would be the best for your application, please Contact Us.